A recent post by Nancy Wallace, Director of the NOAA Marine Debris Program, lays out the simple facts of what we do and do not know about floating debris from Japan’s tsunami in the wake of often unfounded, always spectacular coverage by mainstream news. No, there will not be human remains. No, it will not be radioactive. No, there will not be a giant island of debris arriving all at once, much like there is no giant plastic island in the North Pacific. As fiction constructs, the two not-islands will not collide. I include Wallace’s entire post, below, because it is a testament to the difficulty of describing how discards behave in the wild, particularly on a massive scale. Her post looks to dispel popular myths, propagated by spectacle-based news coverage, and describes, instead, a more mundane, highly contingent, and somewhat unknown phenomenon. It asks for volunteers to help NOAA make the phenomenon clearer to scientists and the public over the next few years. It seems to me that the tsunami debris situation mirrors many discussions in discard studies about new and emerging problems of describing twenty-first century discards “in the wild.” Popular fantasies of “revenge of the discards” vie with scientific assessments and predictive models; as usual, trash, from plastic disposables to nuclear waste and globe-trotting e-waste, does not go “away,” and its behaviors become less and less predictable as the scale of waste exceeds the magnitudes we are comfortable understanding. I am increasingly interested in the methods used to describe this excess, from horror and sci fi narratives (“floating body parts” and “tidal waves of filth”) to mathematical modeling and calls for dedicated beach combers. See the post in its original setting here, and NOAA’s FAQ about the tsunami debris here. A numeric model for ocean surface currents, to predict the movement of marine debris generated by the Japan tsunami over five years. The results are shown here. Year 1 = red; Year 2 = orange; Year 3 = yellow; Year 4 = light blue; Year 5 = violet. On March 11, one year will have passed since Japan suffered one of the worst natural disasters and human tragedies in its history. The 9.0 earthquake and the tsunami that followed claimed nearly 16,000 lives, injured 6,000 more, and damaged or destroyed countless buildings. The Japanese people are remarkably resilient. The strides they’ve made in one year to rebuild their nation are a testament to their strength and ability to band together in a crisis, even though the sense of loss is not gone. Here at NOAA, we’re preparing for a different kind of aftermath from the disaster: the possibility that debris washed into the sea by the tsunami could arrive on shores in Alaska, Hawaii, the West Coast, and Canada over the next few years. While our situation pales in comparison to what the Japanese experienced, NOAA and its partners have taken action to assess and prepare for any impacts. Public buzz about this debris has grown stronger over the past few months, and people are understandably concerned. Where will it go? How much is it, and what is it? What will happen to the beaches, and who is going to clean it up? Here is what we know: It will not arrive in a large “mass,” clumped together in a 25-million ton flotilla, as shock-value news headlines have indicated in recent weeks. That image is dramatic, but unrealistic. At this point, there is no scientific estimate of how much debris the tsunami washed into the sea or how much is still floating. We also know it is highly unlikely any debris is radioactive, and – while gut-wrenching to imagine – there is almost zero chance human remains from Japan will arrive with it. Our coasts are national treasures, and the public should continue to visit them and help us keep them clean. Of course, we urge caution and awareness, especially for boaters, but there’s no reason to fear the shore. So where is the debris? From NOAA’s experiences with other natural disasters, we believe quite a bit of debris sank off Japan’s coast. Satellites that observed “debris fields” in the days following the tsunami lost sight of those fields after one month. What debris did float away has dispersed far across the Pacific Ocean, to the point where our partners in planes and vessels are reporting very few sightings. 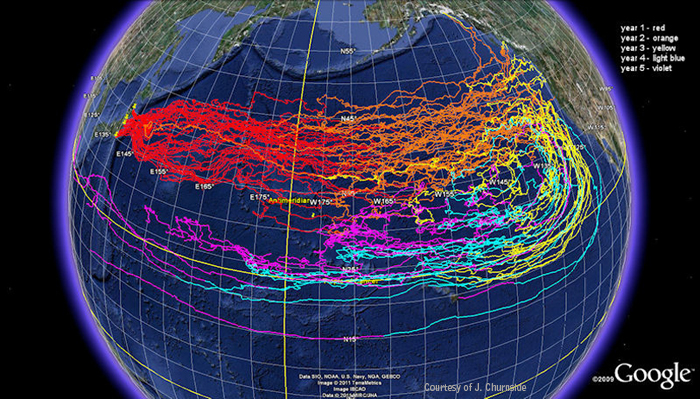 To predict where the debris will go, NOAA and independent researchers modeled its path using historical ocean conditions. Those models gave us a rough idea of when and where we can reasonably expect debris items (that make it across the Pacific) to show up. It is likely that beachgoers on the West Coast and Alaska will start noticing a gradual increase in marine debris items near-shore or on the beaches in 2013. Those on the main Hawaiian Islands might start noticing an increase closer to 2014. These are just predictions and should not be taken as the end-all of what will actually happen. Consider this: the Pacific Ocean is enormous – it covers one-third of the Earth’s surface – and its currents and winds are constantly changing. Any debris still floating in the water has been at the mercy of one year of storms and weathering. Items will sink, break up, and scatter far across the ocean, or they could get pulled into existing garbage patches. Models do not take this into account, and we have no way of knowing how an individual piece of debris will behave. While it’s impossible to tell exactly what will make it across, it will likely be items that float easily: buoys and other fishing gear, plastics and cans, barrels and drums, lumber, or even appliances. Boats are also a possibility. These items can impact navigation, ensnare animals, damage precious reefs, and litter the beaches. Given all the uncertainties, the NOAA Marine Debris Program and our federal, state, and local partners have been preparing contingency plans for the past several months to protect our natural resources. These plans will help guide local responses in case we need to remove large, hazardous, or unmanageable items. We also reached out to the Japanese government, which has done a considerable amount of work to track this debris, even while dealing with incredible tragedy and nation rebuilding. If items from the tsunami do wash ashore, we ask people to remember that they represent loss. Any pieces that can be clearly traced back to an owner should be reported to a Japan consulate, so that they might be returned. Check out what else the NOAA Marine Debris Program has been doing to monitor and prepare for the debris. In recent weeks, beachcombers have caught sight of buoys and other items washing up on the West Coast, Canada, and Alaskan shores. Although models suggest most of the debris won’t show up until sometime next year, NOAA is not ruling anything out. It is possible for highly buoyant debris to catch wind and arrive ahead of expectations. The truth is, what now floats our way is part of a larger problem. Marine debris, even buoys and other debris from Asia, persists in many of our coastal communities every day, and that’s why it’s hard to tell if any one item came directly from the tsunami. No matter where it comes from, we should all take comfort in this: debris is – for the most part – removable and preventable. If you see small debris, pick it up and examine it. Items that have no identifying markers should be disposed of properly, but if it belongs to someone, alert a local authority. You can also report large volumes of debris or items that clearly came from Japan to DisasterDebris@noaa.gov. There are other easy ways to help: join a beach cleanup or recommit yourself to recycling. Some items should be left to the authorities. We urge beach cleaners not to touch anything that appears hazardous or too large to move safely. Report it, and it will likely be dealt with by local emergency responders. This is a challenging situation, to be sure, and it will take everyone working together to address it. But if we remain aware and take action, we can reduce the impact marine debris has on our environment now and in the future – whatever it may bring. NOAA needs beach monitors to help us survey the shores for baseline marine debris data. That way, if more debris starts appearing, we’ll know the leading edge of the tsunami debris may have arrived. You can request NOAA Marine Debris Program protocols at MD.monitoring@noaa.gov. This entry was posted in Waste and tagged japan tsunami, marine debris. Bookmark the permalink.